I haven’t read many books since school started. It’s really sad. I comfort myself by saying I’m doing more of other types of reading, but it’s still pretty sad. I’ve had a hard time blocking off enough time to read steadily, and if I don’t read several chapters to get into a book I have a hard time plugging away. I’m in the middle of two or three books right now, so hopefully I’ll have more to report later. 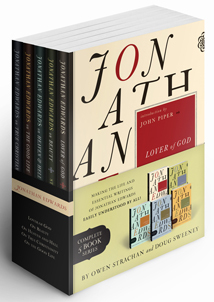 I’ve been slowly working my way through this 5 book introduction to the life and works of Jonathan Edwards. So far, I’ve read the first book (Lover of God), about half of the second, and parts of the other three. I’ve learned so much! 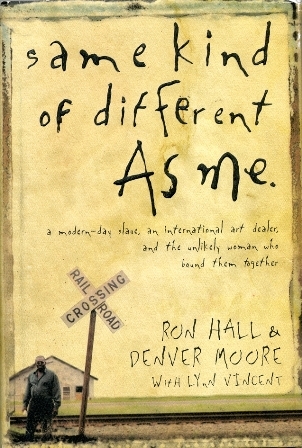 This is a powerful, true story about a wealthy couple, Ron and Debbie Hall, who befriend a homeless man, Denver Moore. The story was so gripping I read the entire book in one night, often sobbing uncontrollably at the sad story of Debbie’s battle with cancer and marveling at the unconditional love she showed to Denver. I highly recommend this book, and I hope it has as great an impact on your life as it did on mine. I’m Back, November 1, 2006, reviewing The Man Who was Thursday, Condi: The Condoleeza Rice Story, A Light in the Window, These High, Green Hills, and Jennie Gerhardt. Magnetic Poetry, August 28, 2007. Hugh Laurie and Stephen Fry, August 30, 2007. Introduction to Poetry, August 30, 2007. Serious Humor, August 31, 2007. January Book Review, February 4, 2008.